The Greek parliament has approved a package of social measures, despite warnings from the European Commission against "proceeding unilaterally". In parliament, the Greek Prime Minister Alexis Tsipras defended what he called a "humanitarian crisis" law. The law - the first to be introduced since Mr Tsipras's party won elections in January - offers food stamps and free electricity to the very poorest. The total amount of assistance is worth about €200m ($213m; £144m). It is the kind of anti-austerity measure that Mr Tsipras had promised before his election victory in January. In a 30-minute speech he defended the legislation, which he described as the first bill in five years to be drawn up in Athens, rather than ordered by EU technocrats. He also criticised a leaked letter from an EU official, which had advised Greece to consult with its international creditors before proceeding with the legislation. 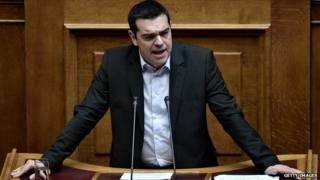 "If they're doing it to frighten us, the answer is: we will not be frightened," Mr Tsipras told parliament. "What else can one say to those who have the audacity to say that dealing with a humanitarian crisis is a 'unilateral action'?" The new law, and Mr Tsipras's defiant speech, come ahead of an expected meeting with Angela Merkel and Francois Hollande on the sidelines of an EU summit in Brussels this week. Greece is still in dispute with its international creditors about the terms of an extension to its huge financial bailout, with the eurozone demanding that Athens commit to spending cuts to release further loans. Relations between Brussels and Athens have soured dramatically. With Greece currently shut out of debt markets, concerns have been expressed that the country could soon run out of money.